ATHENS, Ala. – Brandon Pedigo wins the American Bass Anglers Ram Truck Open Series Area 7 Championship on Lake Texoma. Running out of Highport Marina near Pottsboro, TX a cool 37 degrees with bone chilling North winds on the morning of day one made everyone aware that the warm, calm days of summer were behind us. Practice throughout the week proved that the lake was going to fish very well, until mother nature threw us a curve ball with a cold front, and a 40-degree swing in temperature. Leaving the ramp around 7:15 both mornings and weighing in at 3 PM the anglers needed to take full advantage of every hour they had on the water. Some had been on a 20-pound bag throughout the week but found the fish had re-located from the winds. Day 2 set up a little warmer and calmer, but the winds had shifted to the South, which changed the game yet again. One thing about Texoma that everyone loves is the opportunity to land some Smallmouth Bass, and some anglers did just that. Brandon Pedigo of Lawton, OK managed limits on both days, but started off with a bang on Saturday. 19.23 pounds of smallmouth led the field to start things off, separating him from the rest of the field by five pounds. 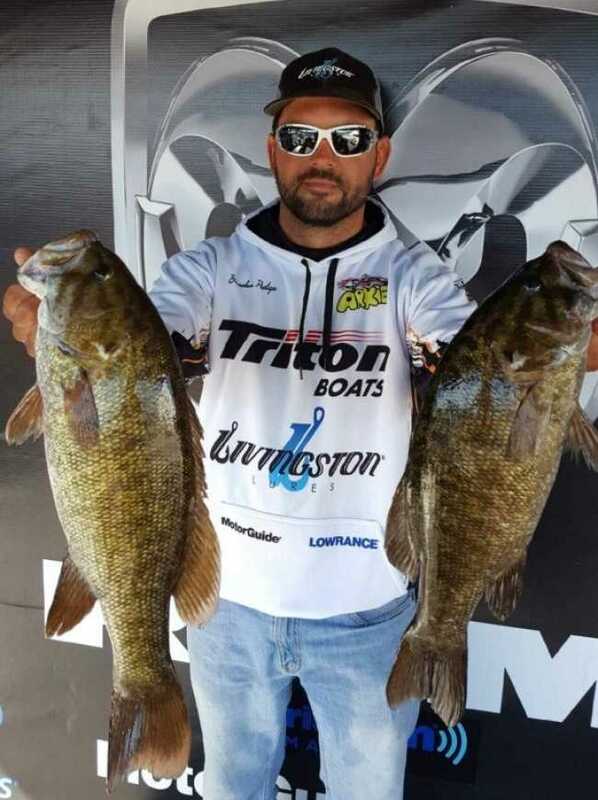 He followed it up on day two with 11.17 pounds for a two-day total of 30.46 pounds to win the event by a four-pound margin and take home the guaranteed check for $10,000.00. “This weekend I was chasing schools of fish on sand banks, but it had to have stumps or some sort of structure to hold them. They haven’t moved all the way up yet. I started with a Livingston Divemaster 12 series. I caught a limit Saturday by 8 AM in one area and the wind had them wadded up. I knew I had to rake through them and catch every one that I could because the wind was going to change on Sunday. Most of the time guys will save some fish for the second day but I had the feeling I wouldn’t be able to do that with the weather, so I caught as many as I could the first day. The wind changed today and changed the position of the fish and we had to make some adjustments, but I caught one last smallmouth at the end of the day that made the difference,” said Brandon. Brian Gambill of Sachse, TX made an incredible move from day one to day two. 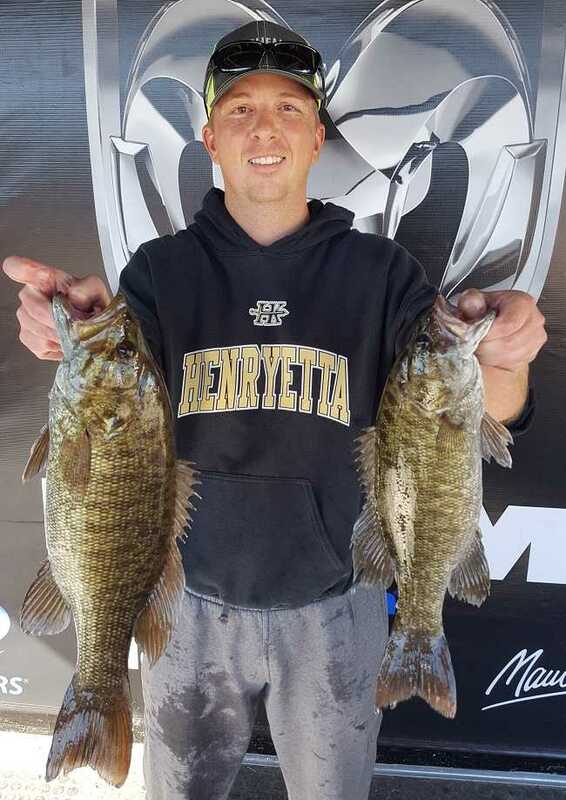 Landing a five-fish limit on day one weighing 7.80 pounds, Gambill was back in the middle of the pack, sitting in 34th place, but a crushing 18.28 pound five-fish limit on day two allowed him to climb the ladder and finish the event and finish in second place. He collected $1,100.00. for his second-place finish. “The fish I wanted to go after were dead in the wind on day one sitting in 24 feet of water, but I just couldn’t hold the boat on them. I ran some areas that were a bit calmer to get my limit on the first day but today I was able to stay where I wanted and put together a good bag of fish. I did miss one that would have put me a little closer to the top but I’m not sure if it would have changed the outcome,” said Brian. 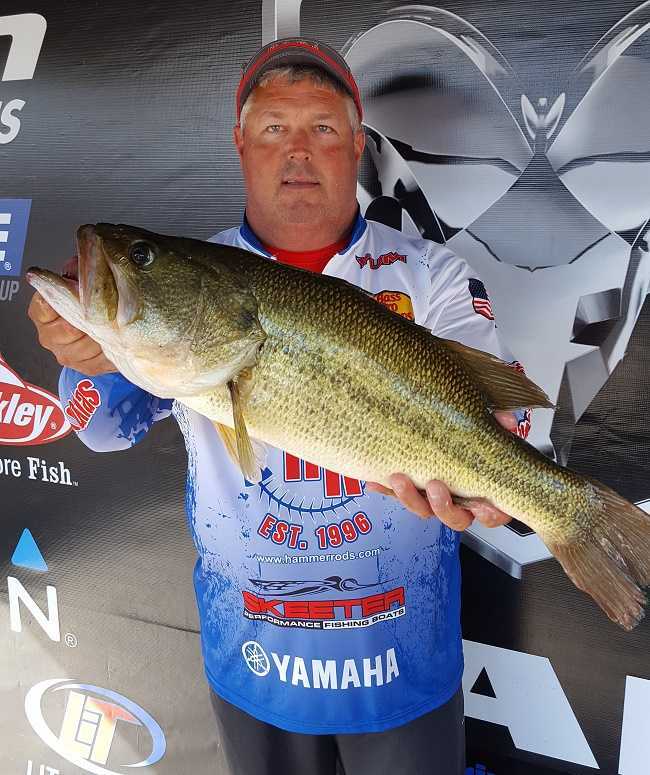 Lee Sanders of Stillwater, Oklahoma finished in third place with a two-day total weight of 25.66 pounds. Staying consistent for Lee was the key to his finish. He weighed in a five-fish limit on both days that were only six ounces apart. He was the defending champion going in to this event, from 2016, and was looking to repeat his title, but the winds kept him from getting on the bite he had found during practice. “I caught my fish on a football jig on day one. Day two I started the same way, but due to the changing winds those fish didn’t bite mid lake, so I went shallow. Typically, when the wind comes from the south the shallow bite picks up, so I ran to a spot on the west end of the lake and finished up my limit there. I had six keepers on day one, and seven on day two, all the fish I caught were keepers,” stated Lee. Finishing fourth was Alan Smith of Gun Barrel City, TX with 25.21 pounds, and fifth was Rusty Edwards of Bowie, TX with 22.78 pounds. In the Co-Angler Division the weights were so close that anyone could have taken the title. With the leader sitting at 6.90 pounds after the first day, more than half the field was one fish away from taking over the top spot and Shane Cashman of Henryetta, OK made a charge on day two to claim the lead and win the $5000.00 guaranteed Co-Angler title with 13.57 pounds. “Yesterday we ran across to the North side. We caught a couple flipping docks, but struggled most of the day. Today was a lot better. We fished around the dam and I just had better quality bites. I did cull a couple times today, but I didn’t know how it was going to turn out. Obviously I’m thrilled to be up here. This weekend was a lot of fun,” said Shane. Taking second for the co-anglers, Bo Adams, also from Henryetta, OK was lower in the field only weighing 2.62 pounds on day one. Bo had an awesome day two, bringing in the largest bag of the tournament for the Co-Anglers at 10.93 pounds anchored by a 4.21 pounds smallmouth to catapult him in to second place. Bo had a two-day total of 13.55 pounds just .03 ounces shy of winning the title. “We were off shore today and bounced a jig off the bottom. We stayed in one pocket all day but just had to keep the bait on the bottom and drag it around. One fish on the first day and today I was able to bring in a limit.” Bo stated. Matt Montfort of Corsicana, TX placed third with a two-day total of 12.79 pounds. Matt had some good anchor fish on both days that kept him at the top of the leaderboard the entire weekend. Consistent weights of 6.21 and 6.58 pounds sealed his third-place finish. In fourth place among the co-anglers was Richard Burkhart of Caddo Mills, TX with 12.59 pounds. Finishing fifth was Jeffrey Grubbs Sr. of Goodrich, TX with 12.34 pounds. Big bass honors for this event go to Scott Cox of Tom Bean, TX with a 7.71 pound largemouth from day one. Scott caught his fish floating across windblown points and earned the Abu Garcia big bass award for catching the largest fish of the tournament using an Abu Garcia reel. Angler of the Year (AOY) was awarded after this tournament based on accumulated points for the season, and for division 11 Brian Gambill of Sachse, TX repeats his 2016 title to claim the top spot again in 2017 for the boaters. For the Co-Anglers, Jeffrey Grubbs Sr of Goodrich, TX took top honors. For Oklahoma division 14, Boater Brandon Pedigo clinched AOY with his victory in the 2-day championship, along with Shane Cashman of Henryetta, OK for the Co-Anglers. Each angler will receive paid entry into the 2018 season in the division of their choice. 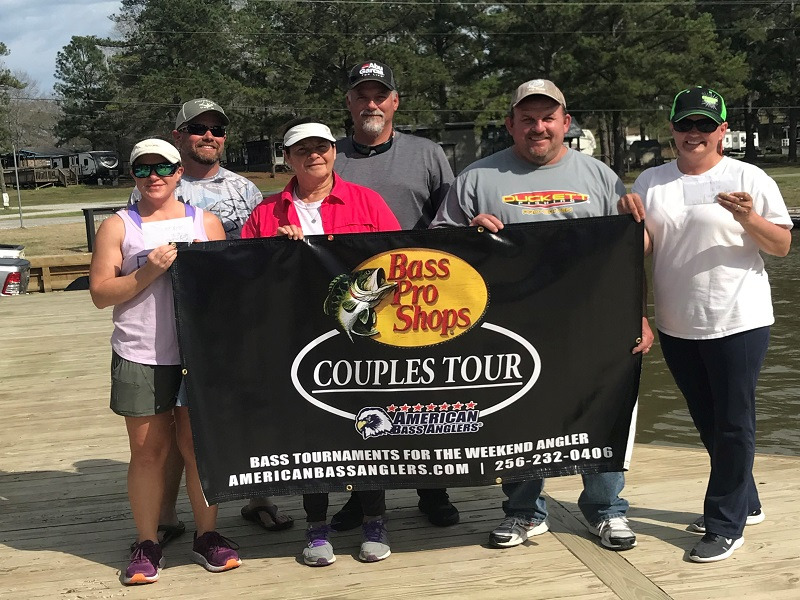 Slated for the first week of April 2018 the top 20 boaters and Co-Anglers from this event were all extended an invitation to the 2018 Ray Scott Championship on the Red River in Shreveport/Bossier City, LA. For more information on this tournament, call Chris Wayand, tournament manager, at 256-230-5627 or ABA at 256-232-0406. On line, see www.ramopenseries.com . 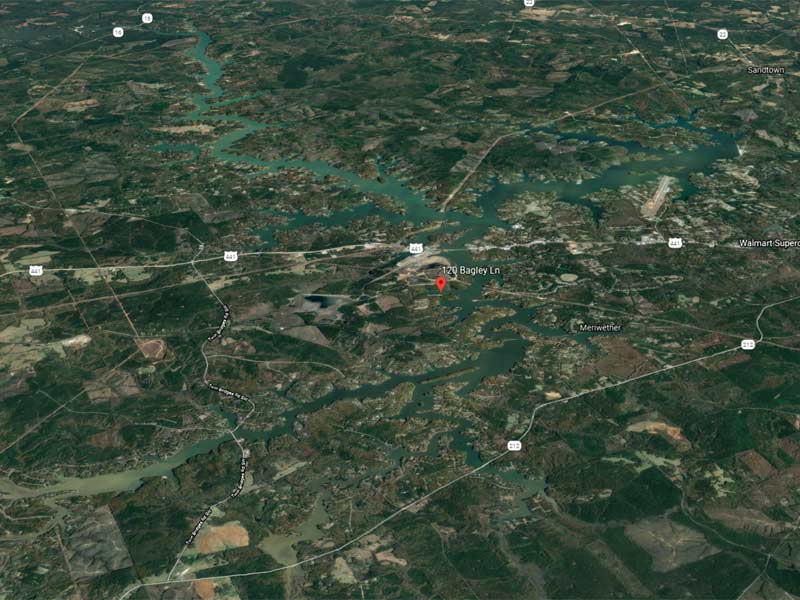 American Bass Anglers, Inc. is supported by Ram Trucks, Triton Boats, Mercury Outboards, Carlisle Tires, GEICO, Berkley, Abu Garcia, T-H Marine, Livingston Lures, Best Western Hotels, Maui Jim, Power Pole, Simms, Garmin, and SiriusXM Marine Weather.